to 00:00:00;00 instead of the default value of 01:00:00;00. If you don’t, chapter markers may not work. Good to have some documentation, but don’t have the hardware to try it out yet. My friend and co-worker Rory Sheridan has received a stunning review of his latest film starring prolific pro-skateboarder and man-about-town Bobby Worrest. Click through here to see the video. Apparently, it required an entire city to do the color grade. And, if you enjoyed this video, check out more of Rory’s work. Here’s my blog plagiarism of the month. Ok, of the week. Are there any original ideas anymore? Pretty awesome and worth making viral. 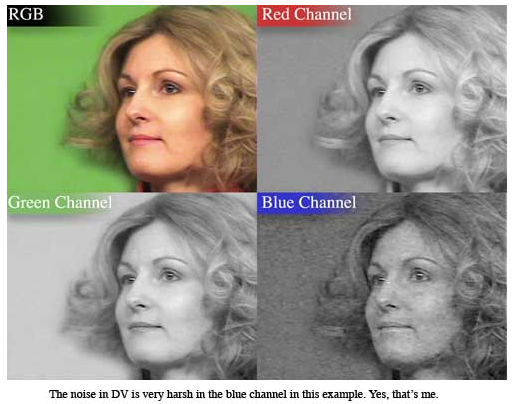 Noise can come from bad lighting, JPEG and other compression induced artifacting, film grain, and half-tone patterns. In DV footage, blue will almost always be the noisiest channel and green is the cleanest channel. There’s some good Shake and FCP techniques so make sure you click through to the article. Thanks for the post Michele. And, you can subscribe to the Toolfarm newsletter here. Ok, a bit outside my normal scope but this is really frustrating. Experiencing freezing while playing Grand Theft Auto IV on my PS3 80GB during cut scenes. The animation freezes and the audio continues. Especially frustrating because this is happening before the end of a mission when you would save your progress. Argh. Qj.net also reports that Rockstar games is working on a fix but there is no ETA. Additionally, GetBent57 links to a 12-step approach posted on gamespot.com. Take-Two appears to be stuck between a rock hard bug and Iron Man this weekend. I’ll post with an update. Hopefully this works because freezing makes the game unplayable.